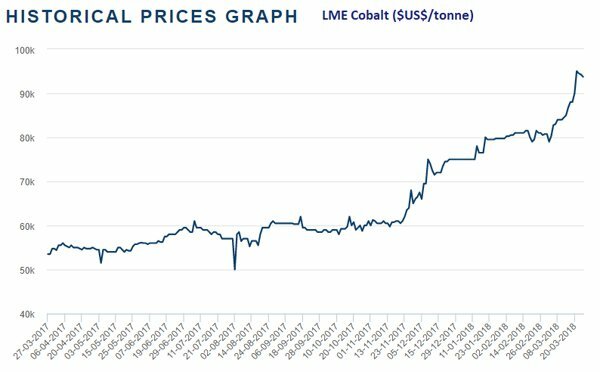 The cobalt price smashed all expectations in 2017, soaring 130% and is now at multi-year highs in excess of US$94,000/t. Yet cobalt’s run didn’t end with the New Year. While we are only three months into 2018 cobalt has already climbed 25%, rising by $US5000/t in a single day in March. And this rally doesn’t look like slowing down any time soon, with demand far outpacing supply — meaning even bigger rewards on offer for the companies mining and exploring for cobalt. This supply demand imbalance stems from global tech companies eagerly vying for as much of the blue rock as possible. With this renewed surge in global demand comes the need for new supplies. Today’s junior ASX explorer is taking proactive steps to capitalise on cobalt’s return to the world stage. The company has identified and is seeking to acquire a number of highly prospective cobalt exploration and mining licences in the DRC that have the capacity to be advanced rapidly towards production. The company recently secured $3.1 million in a capital raising to sophisticated investors, placing it in a strong position to fund the acquisition, expand its existing projects and move quickly on project opportunities as they arise. It has also engaged Airguide International as a strategic advisor. The team at Airguide has a collective total of over 50 years’ experience in global investments across the energy, resources and commodities sectors. Moreover, Airguide has 15 years’ experience in the Chinese commodity space and brings with it a Chinese network looking for high-quality cobalt assets. This is a valuable relationship as China remains the world’s largest consumer of cobalt. This strategic partnership has already started to pay off for the company, with interest in the company rising sharply following the announcement of this alliance. WFR has experienced a particularly sharp rally since March 20 when it announced it had funding secured and a strategic partner engaged — climbing around 300% in a matter of days on significantly increased trading volume. Ultimately, if cobalt prices continue to rise and we see it make progress in the DRC, WFE could climb even higher in 2018. While the company plans to aggressively execute its DRC plans, its ambitions are not limited to DRC. In December last year, the company finalised an agreement to acquire the rights to three cobalt and silver mining claims, covering 2240 hectares, in Canada’s historic Cobalt-Gowganda mining district in Ontario. A number of these claims contain or lie adjacent to historic prospector workings from which previous rock samples have reported elevated assay values for cobalt, gold and silver. - Bloom Lake: 0.3 to 0.9% cobalt, 11.02 to 14.73% copper. - Powerful Prospect: 0.939% cobalt, 100g/t silver. Mining expert Greg Burns confirms that grades above 0.5% cobalt are considered potentially mineable if they are delineated in sufficient tonnages. As always, that’s the challenge. Yet, it is WFE’s cobalt ambition in the Democratic Republic of Congo (DRC) that is generating most of the excitement right now. WFE is fast-tracking its plan to acquire significant cobalt assets within the DRC. This move will put WFE right into the heart of the world’s largest source of cobalt. On March 20, WFE announced that it had secured funding commitments of $3.1 million. This funding is made up of a firm $2.1 million private placement offer to professional and sophisticated investors, including a $500,000 cornerstone investment from Airguide. 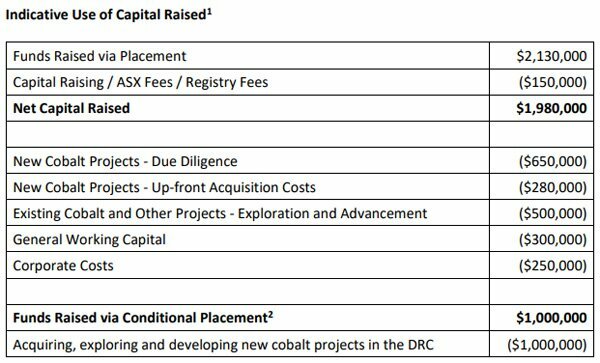 These funds will go towards upfront payments on new cobalt project acquisitions, undertaking due diligence in the DRC, and acquiring exploration and mining licenses. They will also contribute to exploring and advancing other projects, including WFE’s mining claims in Canada. Additionally, a $1.0 million conditional private placement has been arranged with Airguide’s Principals. This placement will proceed if shareholder approval is obtained and if the company enters into a binding agreement to acquire exploration and / or mining licences within the DRC that are considered highly prospective for cobalt and with the capability to be advanced rapidly towards production, and on terms agreeable to both Winmar and Airguide. Of course WFE remain a speculative stock and investors should seek professional financial advice if considering this stock for their portfolio. While the company is yet to identify suitable DRC acquisition targets, this funding gives WFE the financial mobility required to quickly act upon attractive acquisition targets as they arise. In fact, it looks like the company has picked the perfect time to increase its exposure to cobalt, given the blue rock’s impressive price rise over the last 15 months. On the same day it announced that it had secured funding, WFE also reported that it had finalised an agreement with the Singapore based, Airguide International to work as a strategic advisor with the company. Not only does Airguide have experience managing multi-billion dollar client portfolios, but it has also been involved in building, raising capital for and operating multi-million dollar public and private companies across the globe. This engagement is initially for a 12 month period, but may be extended. The objective of this strategic partnership is to secure value-adding take-off agreements, commercial agreements and potential joint venture agreements with African and Chinese companies working in the cobalt sector. Given the thriving state of the cobalt industry, the initial focus of the strategic partnership will be on helping WFE acquire new cobalt projects in the DRC. Airguide is particularly well positioned to help WFE achieve such ambitions, with a demonstrable track record of successfully advising ASX-listed battery metal companies in developing partnerships with both Chinese and African firms. The company is consistently approached by Chinese network looking for high-quality cobalt assets with the ability to grow both production and reserves. It’s one of the few specialist advisors globally with operating experience in both Africa and China, particularly in the DRC and the battery metals area. WFE will pay a retainer fee for Airguide’s services, and, subject to shareholder approval, issue Airguide 100 million performance rights. With such positive indicators already, it’s important to realise that Airguide is not just a strategic advisor, but has also recently come on as a cornerstone investor in WFE. Yet it is not just Airguide who is confident that WFE can execute its cobalt expansion into the DRC. Accompanying the announcement of Airguide as a strategic advisor, the company also announced substantial funding obtained from recent capital raising efforts. Of the four key battery metals: lithium, nickel, copper and cobalt, the supply of cobalt is the most constrained. With an output of only 100,000 tonnes a year, cobalt remains the most expensive battery metal and the most sought after. At the beginning of 2017 cobalt traded for US$32,500 per tonne. It currently trades for US$94,250 per tonne, having risen sharply over the past year. One of the driving forces behind this sharp price increase? The rapidly expanding electric vehicle and lithium battery markets. The world’s most prominent car manufacturers and technology companies are pouring money into both electric vehicles and/or the facilities that produce the equipment inside these vehicles, as well as other devices including new generation smartphones and tablets. Tesla, Dyson, LG, Toyota and VW group, some of the largest companies in the world are all making extensive plays in these areas. Add to this the Chinese government’s plan to have seven million electric vehicles on the road by 2025, and you have a situation where the price of battery metals such as cobalt and lithium are likely to continue rising. While this insatiable demand for cobalt from electric car makers, governments and tech titans keeps pushing the price of cobalt higher, supply remains constricted. WFE’s management has been quick to jump on-board the latest cobalt boom. With over 80 years’ mining, finance and commodities experience between them, WFE’s directors have already taken steps to capitalise on the thriving cobalt market. Managing Director Rod Sainty has over 30 years mining experience, gained primarily in Australia. Rod played a key role in the discovery of three ore deposits: the Baseline Archean gold deposit, the West 45 copper-zinc VMS deposit and the Bentley copper-zinc VMS deposit. All of these mines proved to be profitable for investors, with the Bentley deposit still being worked on to this day. Non-Executive Chairman, Jason Brewer has experience working in mines all over the globe, including: UK, Australia, Canada and South Africa and with investment banks in Australia and the UK. Importantly for the company, for the past two years he has been actively focused on mining opportunities in the DRC and achieving success with other listed ASX exploration companies such as Vector Resources and Force Commodities in the gold and lithium sectors. Having worked in South Africa, Australia and the USA, Non-Executive Director Noel Halgreen, a qualified mining engineer brings over 30 years of experience across iron, diamond and coal mining. Lastly, the company has recently appointed Nicola Betteridge as the company Secretary. A Chartered Company Secretary from Boardroom Pty Limited, Nicola will prove vital to ensuring the strategic decisions made by management are effectively implemented. In particular, Noel and Jason’s experience working on African mining projects will prove especially valuable in the coming years as the company rolls out its DRC acquisition plans. In fact, management’s strategic decisions have already started to pay off for the company, with analysts’ attention now turning positive on this junior explorer. 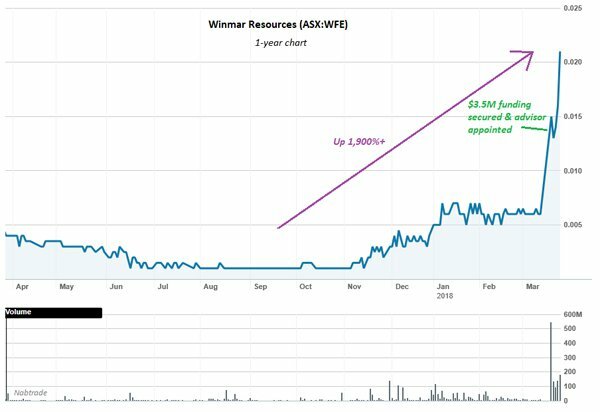 What’s coming next for Winmar Resources? With WFE proactively pursuing cobalt acquisitions in the DRC, the thriving cobalt industry and the company’s already impressive Canadian cobalt assets, there looks to be a lot of upside potential for this junior explorer in 2018. The company should soon have access to $2.1 million in funding — a move that was celebrated by shareholders who sent the share price up more than 300%. With this funding and $1 million more in the pipeline, WFE will have the financial flexibility to investigate desirable cobalt acquisitions, service current cobalt projects and foster additional strategic partnerships. Given that everything points towards cobalt’s price continuing to rise, cobalt-exposed companies large and small, including WFE, stand to not only profit immensely in the coming years and create substantial value for shareholders.